My thesis is about reinterpreting 3 stories by Hans Christian Andersen. This semester I have mainly been working on the Nightingale. In the original story, the Emperor of ancient China strikes up a friendship with a nightingale who sings very beautifully, and invites her (the bird) to live at the palace. Then the Emperor receives a mechanical nightingale which is encrusted with gold and jewels and never gets tired or needs feeding. So he neglects the real nightingale, and she flies away. Then one night the Emperor is very sick, and the figure of Death is literally sitting on his chest. The nightingale flies into the room, and her song so charms Death that he leaves and the Emperor recovers. He repents of his former shallowness and becomes a true friend to the nightingale. 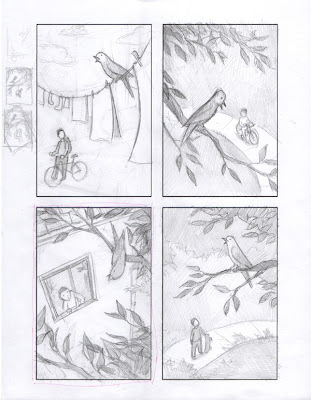 For a while I pondered how to adapt this story to best benefit my portfolio. I thought about what I liked about the story, and the thing that stuck out to me most is the juxtaposition of technology vs. nature. The message is that machines can only imitate, never replace, real relationships. It's a surprisingly relevant theme for a story that was written in 1843! So I decided to put it in a modern-day setting. Instead of an Emperor of China, the main character would be an Asian-American boy, so I can get more practice in drawing children. The rest of the story is basically the same, just a few changes which I shall reveal in upcoming blog posts. 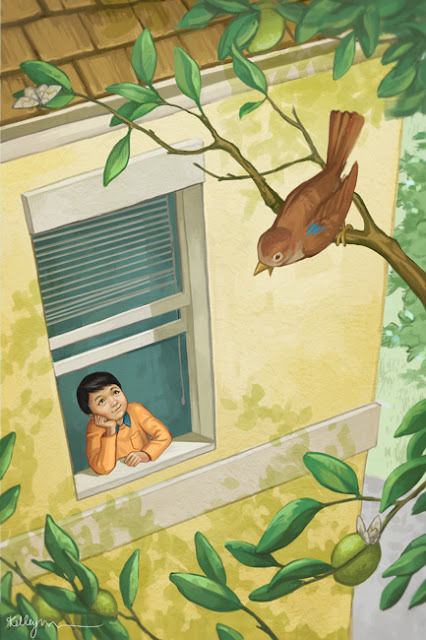 This is the scene at the beginning of the story, where the boy and the nightingale are becoming friends. I really wanted a sunny, warm mood. The nightingale is supposed to be plain looking - that's part of the story - but I added a small blue spot to help it stand out. Originally I meant to have the bird hanging upside-down from the branch, but too many people thought that I had mistakenly drawn the bird at the wrong perspective. So in the end I changed it to a simpler pose. I have 3 more illustrations and a book cover from this story - I hope you'll come back again to see them!